Offering a multi-disciplinary discussion of Gainsborough’s early triple portrait, this project considers the painting as a depiction of polite and refined society, as a reflection of the growing wealth of a global mercantile elite, and as a ‘painting within a painting’ by an artist as renowned for his landscapes as he was his portraiture. The mid-eighteenth-century ‘conversation piece’ Peter Darnell Muilman, Charles Crokatt and William Keable in a Landscape was painted by Thomas Gainsborough (1727–1788) when he was still making a name for himself as landscape and portrait painter. It was acquired jointly by Gainsborough’s House and Tate in 1993 and is regarded as a masterpiece of this early phase of his career. This project draws together expertise from the fields of art history, conservation, history of commerce and musicology to throw light on the social and cultural milieu that gave rise to the commission. 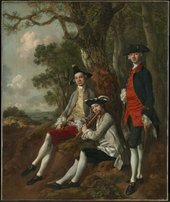 It asks as many questions about the financial and social privileges of the portrait’s sitters as it does about Gainsborough himself, proposing new ways of understanding why Muilman, Crokatt and Keable presented themselves making music in the midst of a remote rustic landscape. Published in January 2017, the project includes essays by art historians Dr John Chu (National Trust) and Dr Peter Moore (Gainsborough’s House), conservators Rebecca Hellen (Tate) and Alexandra Gent (Tate and Courtauld Institute of Art), historian Dr Huw T. David (University of Oxford) and musicologist Dr Hannah French (Royal Academy of Music), who also contributes a flute recording and an interview.